Sharing links and basic information in the process of considering various assets, crypto, and tokens; Also vote for your favorite for giveaway eligibility! Vote for your favorite and leave your bitshares user name for giveaway. Check recent prices for steem(it) bitshares UIAs and others for BITSHARES, STEEM, STEEMFACTORY, TASKMANAGER, TRAIL, VIRGROW, VIVACOIN, WANGCHANGE, and ZAPPL bitshares UIAs (User Issued Assets). 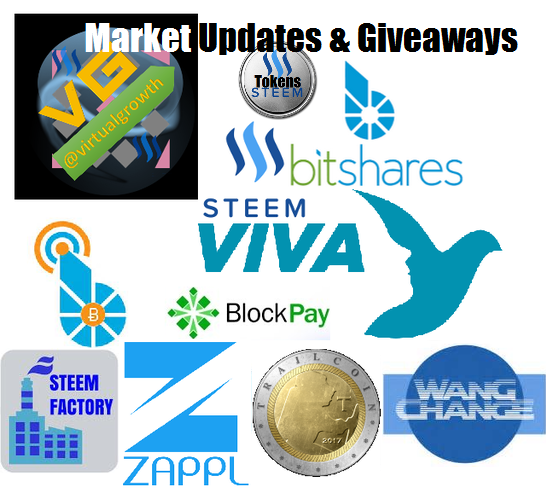 Will continue giving away while providing information and updates while encompassing virtualgrowth ideas with VIRGROW and xVG on/with bitshares and tradeqwik/viva respectively. So please feel free to look through my ideas and let me know what you think and I will consider doing this again in some ways based on our shared interest and learning. While I also think towards a possible crypto gamification of some sort through my experimenting and seeking way(s) to learn and help others learn while sharing energy and time through a mixture of traditional and philosophical ideas and means. VIRGROW and virtualgrowth will continue to evolve in(to) some form of decentralizing exchanging and sharing of energy and time. Cryptocurrencies has brought us so much that may in fact be so little of what may be potentially possible as we all seek to learn more about these amazing creatures we call cryptocurrrencies... So let's get started, "A" is for "Apple", I mean "A" is for APPX(.WARRANT). If you don't have a bitshares / OpenLedger account yet you may sign up for on here. And if/when you do please comment/reply with your new bitshares name and (so) I may reward you with a surprise based on your activity from time to time. Also check out TradeQwik to trade with Viva coin related crypto as well as xVG, TRAIL, and XWANG which are available for trade as well. Continue to vote for your choices and now vote for as many as you want. From now on you will receive a PRIZE token which will be part of a Bitshares Trading Contest of which you will have the option of redeeming the token for the (giveaway) token of your choice or working on accumulating PRIZE tokens as the top holders will rewarded from 20% of the prize pool with 80% of the prize pool for PRIZE redemption. Votes will go towards choosing a variety crypto and tokens that will be part of a sort of decentralized fund being managed by you the participants. This new idea will help decentralize some aspects of my ideas getting more people involved and interacting. Please leave your bitshares account name fora giveaway token which you may redeem for other tokens on the open market or collect more of to win part of the prize pool as one of the top PRIZE token holders! "Members of Steemprentice Crowd Guild receive a share of Curation rewards earned by the @steemprentice account paid out monthly." I can't recall seeing my monthly payments like I used to. What's up with that? If you are no longer adminstering this, then I would like to be refunded. Always glad to see this post and send in my vote. Thanks for sharing and have a blessed weekend. This post has been ranked within the top 50 most undervalued posts in the first half of Aug 12. We estimate that this post is undervalued by $15.10 as compared to a scenario in which every voter had an equal say. One of my friend from India need some donations, she is trying to help her people. If you have free time please check her post and if you want to help her people please contact her.